The GDPR is a regulation in European Union (EU) law on data protection and privacy for all individuals within the EU. It took effect on the 25th of May, it replaced the 1995 Data Protection Directive. For European residents, the new regulations aim to increase their control over their personal data. For businesses, the GDPR applies anywhere in the world if it processes the personal data of anyone residing in the EU. It doesn’t matter if the company has no offices or employees in the EU, or even if no transactions are carried out in the EU. If you process an EU citizen’s personal data, then you need to comply with the GDPR. 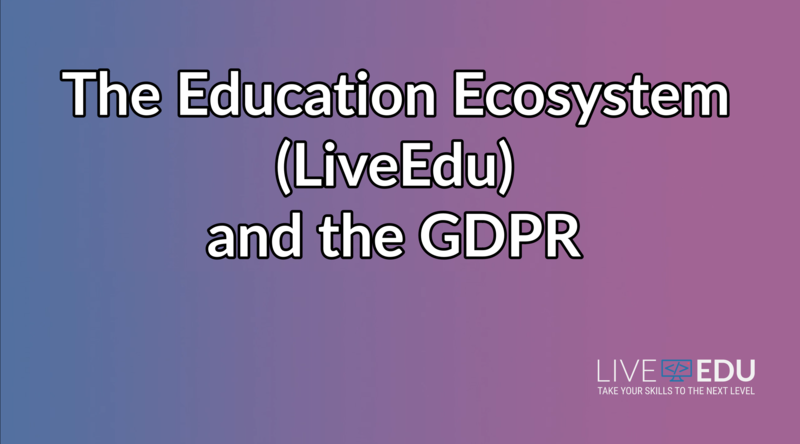 LiveEdu is committed to complying with all the requirements of the GDPR. Our policy experts have closely analyzed the requirements and continue to monitor the GDPR to find best practices for implementing the requirements of the GDPR. We took the new requirements seriously, and have made the required changes to ensure that by May 25th 2018, we were fully in compliance with the GDPR. We will also be making changes to LiveEdu on a continuous basis to help you maintain compliance with the regulation. The LiveEdu team has already implemented the necessary security protocols to ensure that our users’ data is secure. Data is pseudonymized, and encrypted where applicable. We have also implemented automated safeguards at the application and infrastructure level as a proactive means to keep user data safe while ensuring compliance. Improvement in our description of our privacy practices that explains how you can make choices about your information, and the measures we’ve put in place to keep your information secure. Microsoft Buys GitHub: What Next?